Tucked away from public roads and paths, the Priest’s Plain (Præstesletten) isn’t the sort of place people just stumble across. You can picnic here in peace, hunt for rare grassland fungi or simply enjoy the view. This large, open, high-lying plain is surrounded by centuries-old oak trees and a number of ancient burial mounds, testament to the fact that people have frequented the site for thousands of years. To the far south, the ancient, gnarled oak tree known as Vorteeg towers over the landscape like a canopy in a fairy tale. 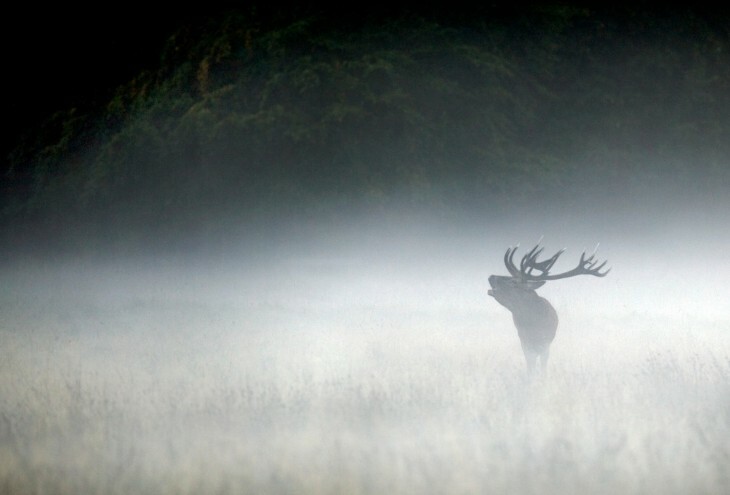 In ancient times, priests and holy men – druids – met on the plain in the middle of the Deer Park, to conduct rituals and make sacrifices to the gods. The name Priest’s Plain dates from more recent times. Priests in Lyngby had the right to graze cattle on the plain until the king made the Deer Park a royal hunting ground in 1669. A large number of deer live there to this day, and it has also become a rich habitat for many unique species of fungi. Just north of the oak tree, embankments rise out of the terrain, the overgrown remains of a defensive stronghold that could accommodate 300 men, built in 1894. Today, the serene plain is a place of more peaceful pursuits, like midsummer meditations on the druids’ old ceremonial site. The Deer Park provides plenty of opportunities for long walks, jogging and cycling in beautiful surroundings. There are several riding trails. By Fortunen, in the south-west part of the Deer Park, children (accompanied by adults) can go pony trekking. Horse-drawn carriage trips are also available. Skiing, tobogganing and skating in winter. Horse-drawn carriages are available for hire at Klampenborg Station. In 1669, the Deer Park was set up for riding to hounds, which involves riders and dogs chasing an animal until it is exhausted. The dogs corner it until a hunter catches up and puts the beast out of its misery with a special hunting knife. Riding to hounds requires plenty of hunting trails, like those in Gribskov and Hareskoven, two other wooded areas in Denmark. The Deer Park – official name Jægersborg Deer Park – was adapted for riding to hounds in 1669, inspired by practices in France. It had the added benefit of supplementing the royal household, as the Court ate its way through 1,000 deer a year at the time. Approximately 1,500 metres north of the Priest’s Plain is Christian V’s oak, planted while he was crown prince. It now has a circumference of eight metres. Fate can be cruel, as we know, and in 1699 the King received a heavy blow from a deer he was about to kill near the oak – a blow that is thought to be the real reason for his death a few months later. Rare and protected species of fungi, old freestanding oak trees and a range of typical grassland plants. Deer Park is also well known for its many hawthorn bushes. As well as a rich assortment of birdlife, there are around 2,000 red, fallow and sika deer (the latter were a gift to Christian X from the Japanese emperor in 1923). There are asphalt pathways from the Hjortekærporten entrance to the Hermitage Palace (Eremitageslottet), and from the Klampenborg entrance to Skovridergården. Some of the hills have also been paved. The roads are generally in good condition in the Deer Park and suitable for wheelchairs. There is no wheelchair access to the Priest’s Plain. There are several food and drink outlets in and around the Deer Park.